I’m 34 years old. Married, with two daughters. Nail art was something that just became so normal to me at a very young age. I started collecting nail polish around the age of 7 when my grandma let me buy a little box of about five colors from a garage sale. 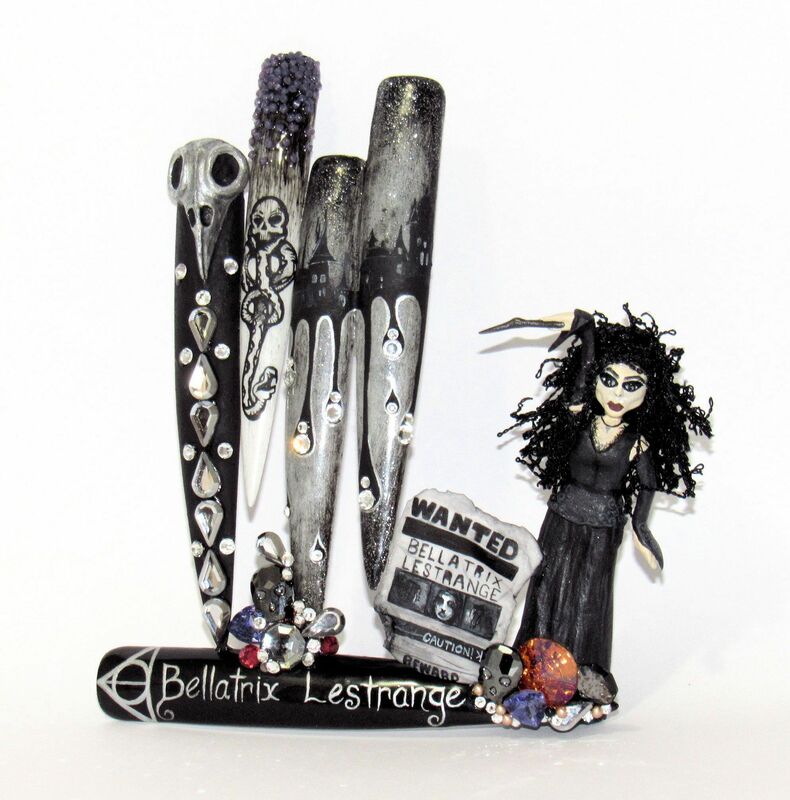 It soon turned into a collection of press on nails, that I begged my mom for from the store, and customized with my original ideas. 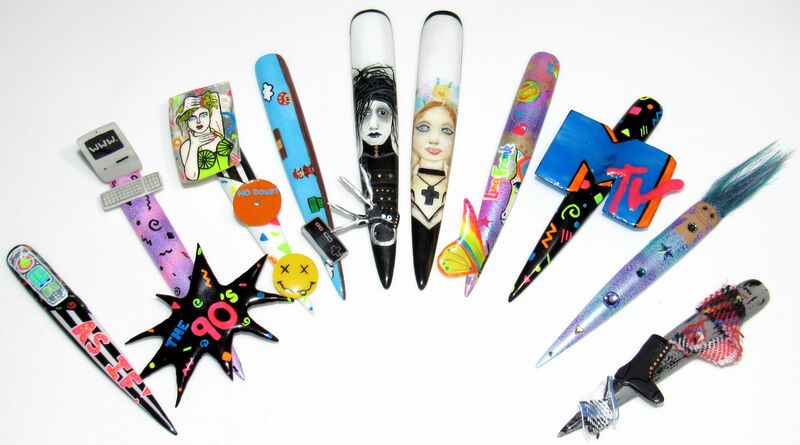 I’ve been collecting nail art supplies ever since. I went to nail school and graduated in 2004. I worked a couple different places before putting work on hold to have a family. After my second daughter arrived, I decided to dive completely in, and began renting a salon suite. It was the best decision of my life! 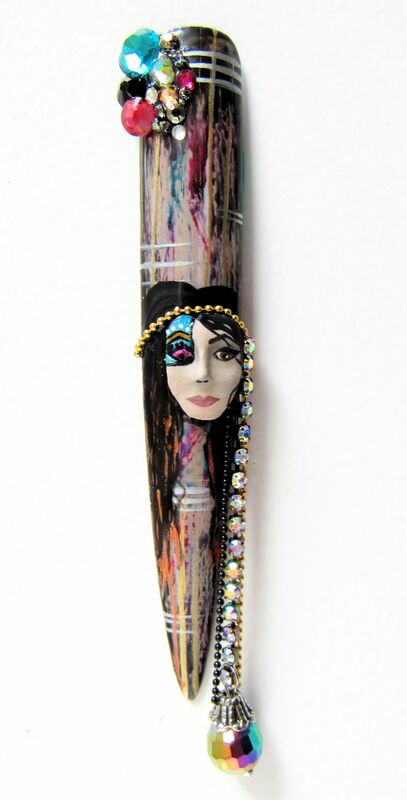 I come from a long line of artists that includes jewelry making, drawing, painting, you name it. So, naturally, here I am. 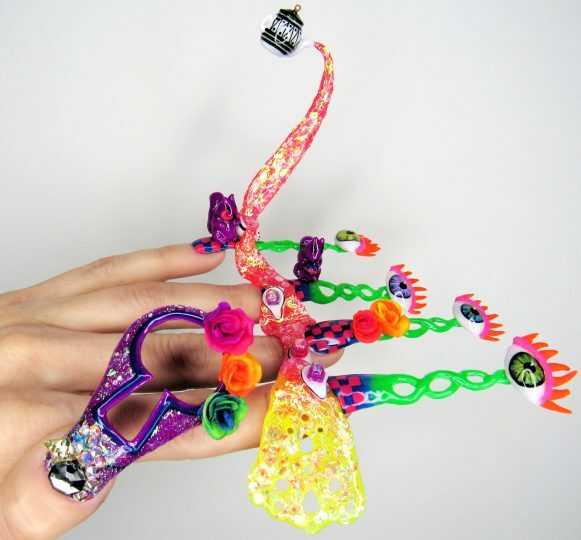 I enjoy all forms of art, but nails for me is my passion. I love being challenged, and I prefer to have art in every aspect of my life. 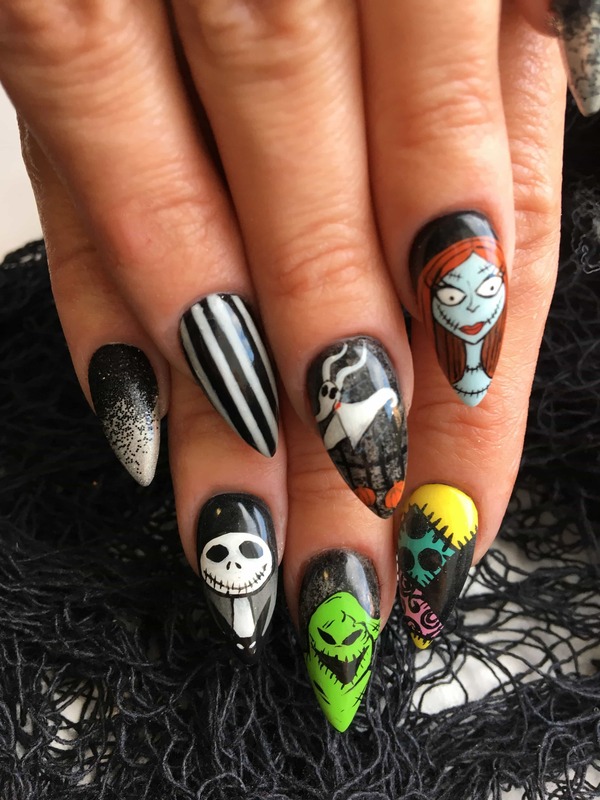 I enjoy networking with other nail artists and I’m happy to be back again this year! As a lover of many types of art, I was more than excited to get inspired by one of my favorite artists, Salvador Dalí. Though sometimes a bit controversial, Dalí had a groundbreaking impact on the art world. Dalí is one of my favorites because he stayed true to himself. He was unapologetic for his thoughts and his art. He shared with us his deepest dreams in beautiful works of art, the type of art you can stare at for hours, wondering what it all meant. Beauty of the mind and soul at its finest. To bring up images from his subconscious mind, Dalí began to induce hallucinatory states in himself by a process he described as “paranoiac critical.” This state helped him to produce paintings which led him to become the world’s best known surrealist artist. I attempted to relax, and meditate into a state of nothingness, as Dalí did, to help me decide on my project. As soon as I was aware, I immediately sketched my design onto paper. From there, I was able to add or subtract certain details. Dalí is an artist I would never attempt to recreate. However, I paid homage to a few of my favorite artworks from him in my design. As you take a look from your ordinary world through the keyhole, you’ll find a world of magnificent imaginary details. Some of the details of my design are connected to Dalí including the checkered floor from “Metamorphosis of Narcissus,” the melting effect from “The Persistence of Memory,” the eyeballs from “Spellbound,” the table and dining feel from “Living Still Life,” and the rose from “Rose Meditative.” I also couldn’t help but add a couple of purple woodland squirrels, one of which has a Dalí look about him. 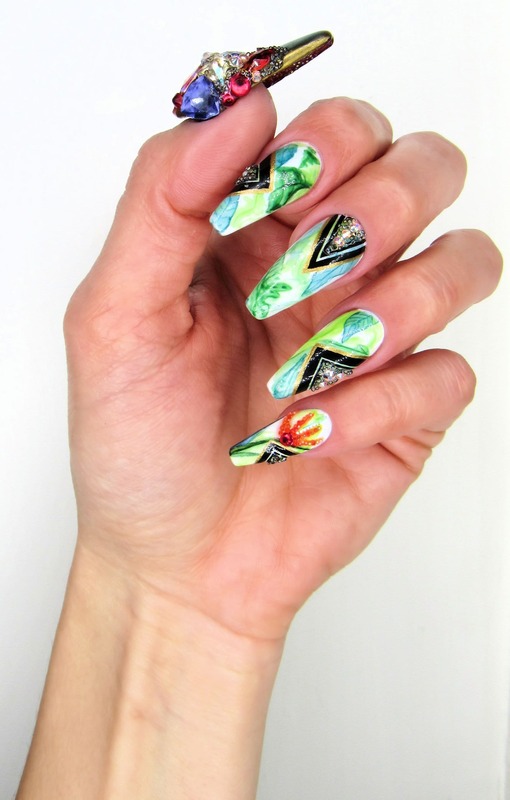 Click here to watch a video tutorial for these nails. I was immediately inspired by my memories of theme park rides I have been on. I am quite cautious in life, but I do love a good adrenaline rush! My favorite rides at theme parks are super-fast, upside down roller coasters, and anything high up in the air. I also enjoy the spinning swings. I find them quite relaxing. 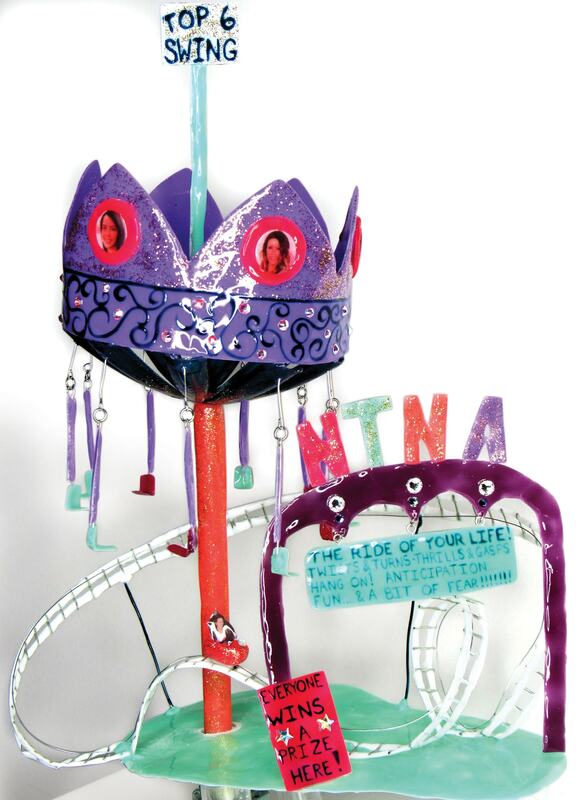 I decided to design my theme park around the NTNA competition, using the tagline “The Ride Of Your Life.” Let’s face it, this definitely is the ride of my life! The tagline goes on to read, “Twists and turns, thrills and gasps! Hang on! Anticipation, fun, and a bit of fear!” This is all so true. I incorporated the Top 6 because they are all on this ride with me. It was a bit tricky to get my coaster into the exact position I wanted, but I reinforced it with the 4D Gel top coat for strength, and I was still able to mold it into place. Everything else worked like a dream, and I had a lot of fun designing my rides. 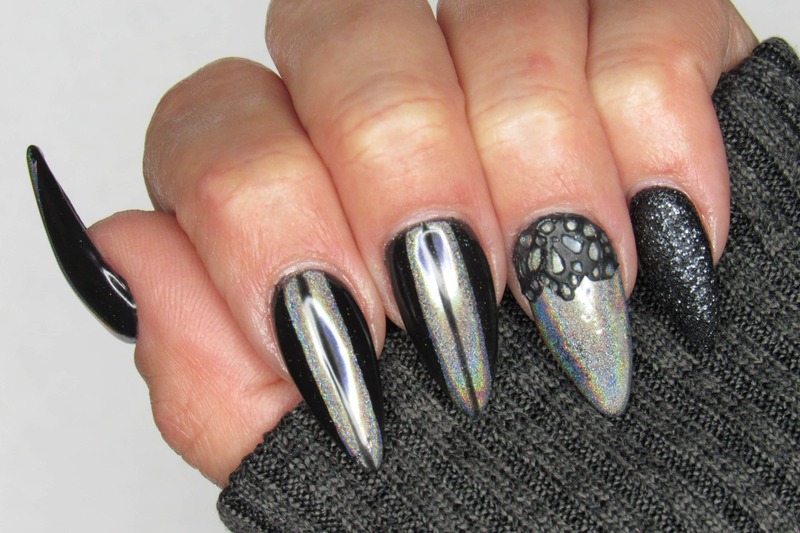 When I think of negative space nail art, I picture random designs created with half-moons, French tips, and line work. 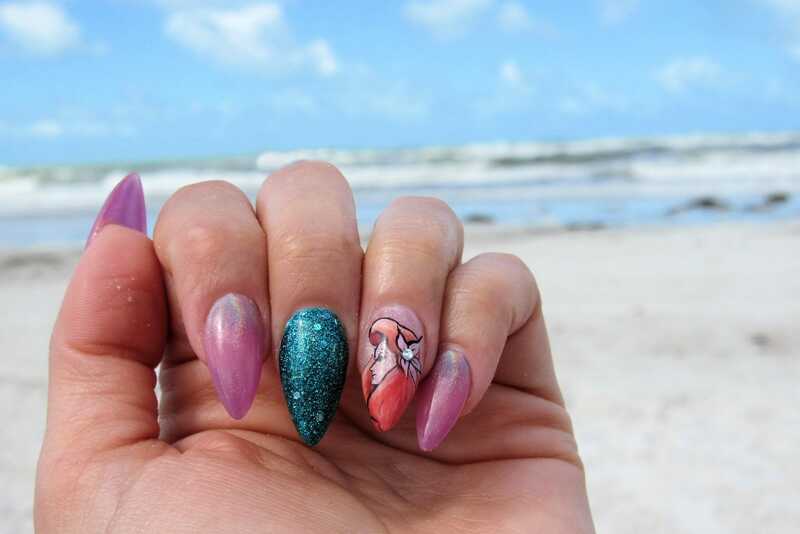 I wanted to offer more than the typical negative space nail art. After looking through inspiration, I decided that I would design a set of nails around something specific: fine line triangular symbols. This worked out perfectly because I wanted to incorporate the “Unity” gel base, color, and top coat. There are many meanings to triangular symbols in religion, as well as in the creative world. When two triangles are combined, it can be used to demonstrate humanity. As one of the oldest symbols in existence, triangles have a range of meanings and can be used within nearly any design. I chose to include the ones that I personally connected with. I was mainly inspired by the beautiful tattoo designs I’ve been eying for myself. The way that the artists make their work look like beautiful pieces of draping jewelry is amazing. This is why I added the draped lines and dots to each nail. I chose cool shades for my palette because I wanted my design to be relaxing, with a calm flow. Street art is a form of human expression. Art is beautiful, and so are pastel shades. 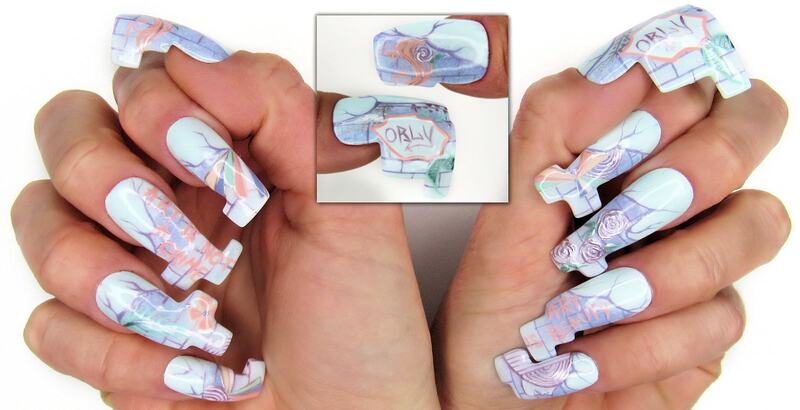 So I thought that creating a beautiful set of street art nails in ORLY’S new collection “Pastel City” was a great idea! While sometimes bad street art can ruin a very nice downtown building, making all neighborhoods seem run-down and uninviting, there are places that have been beautified by amazing works of art in so many cities of the world. These buildings have been used as a canvas for amazing reasons. Maybe it’s to be political. Maybe it’s to raise awareness, or maybe just because “Art is beauty.” To me, all art is beauty, not a crime. I extended my nail tips in a brick pattern to give it more of an edge, and I stuck with beautiful images cascading across the nails in pastel. Pastel street art is hard to come by, although I did find a few images that matched the theme. I took most of my inspiration from street art that was created around nature and beauty. 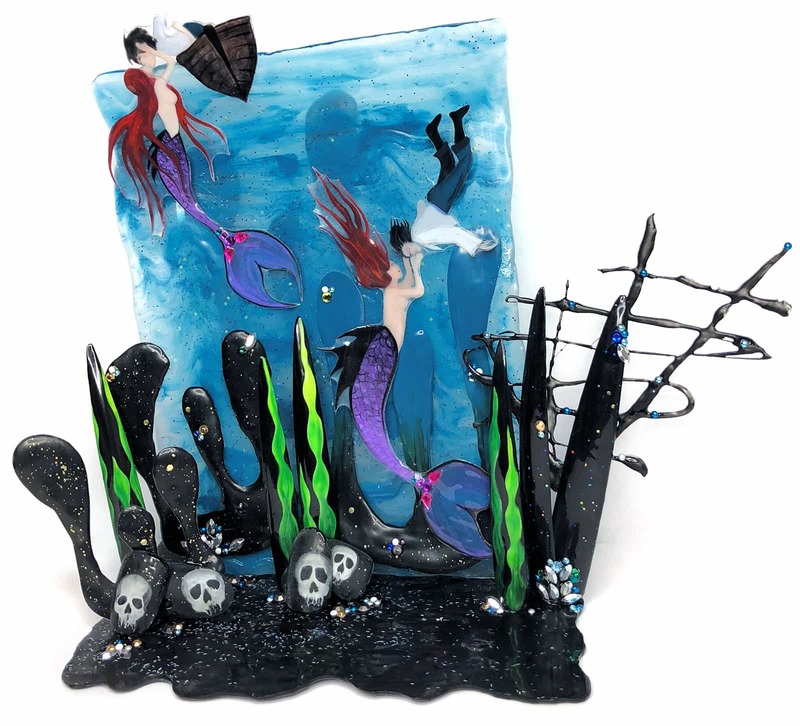 While it took me quite a while to think of a million and one sad love stories, I decided to stick with what I know: Darkness, creepiness, and mermaids. I love dark mythical creatures, and a siren fits quite nicely into a love story gone wrong. Sirens are mythological creatures who, like mermaids, used their beauty and enchanting singing voices to attract sailors. Sirens had wicked and evil intentions, though. They used to drown the sailors into the sea. Once upon a time, a sailor was attracted to a lovely singing voice far out to sea. He had seen a glimpse or two of a mermaid, or so he thought. So he sailed into the dark night in a small boat from his ship, to find the beauty of the sea. Once he found her, he fell deep in love. He leaned over the boat to kiss his love. Little did he know that she was, in fact, a siren. She lured him to her, only to drag him to the deepest depths of the sea for all eternity. I love the myth of the siren because she embodies darkness, wickedness, and yet somehow remains beautiful. There are so many things or people that go hand in hand, but of course, my first thought was squirrels and acorns. The cute ideas were consuming me! 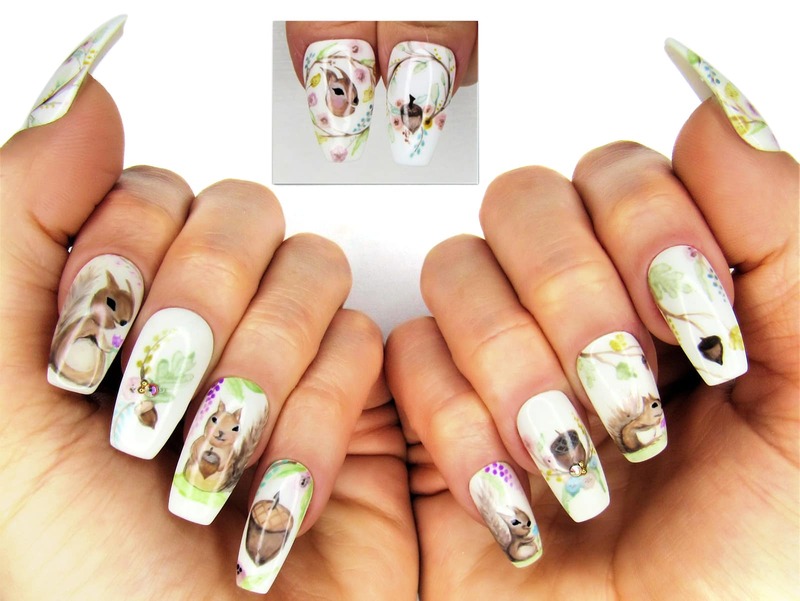 I ultimately decided on a floral chic nature look to pick up the design a notch, and bring more color into the nails. I chose to paint using a watercolor technique to keep it storybook-like. To create a watercolor effect you’ll need gel-polish, a cleanser, and a small detail brush. 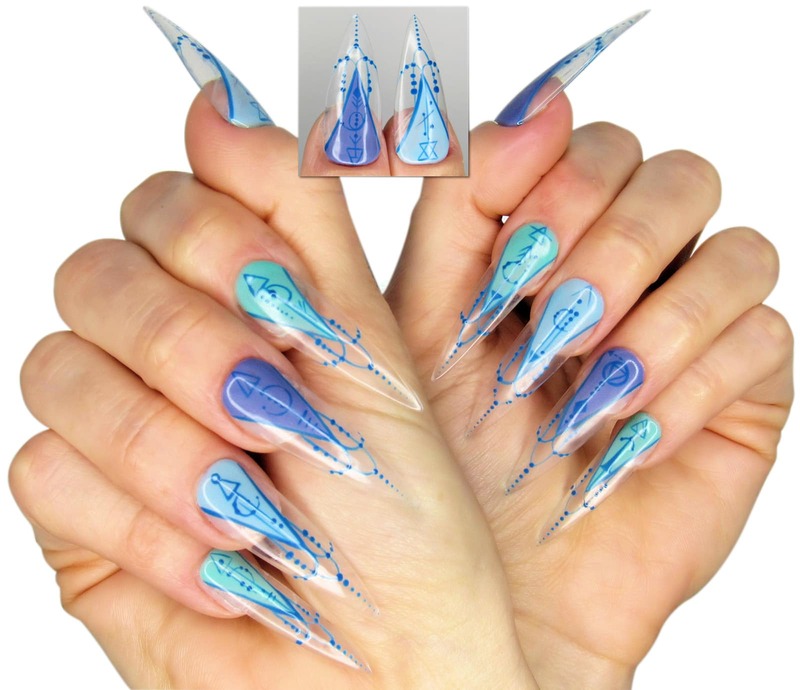 Thin out your gel-polish using the cleanser until the desired consistency, then begin to paint your design. 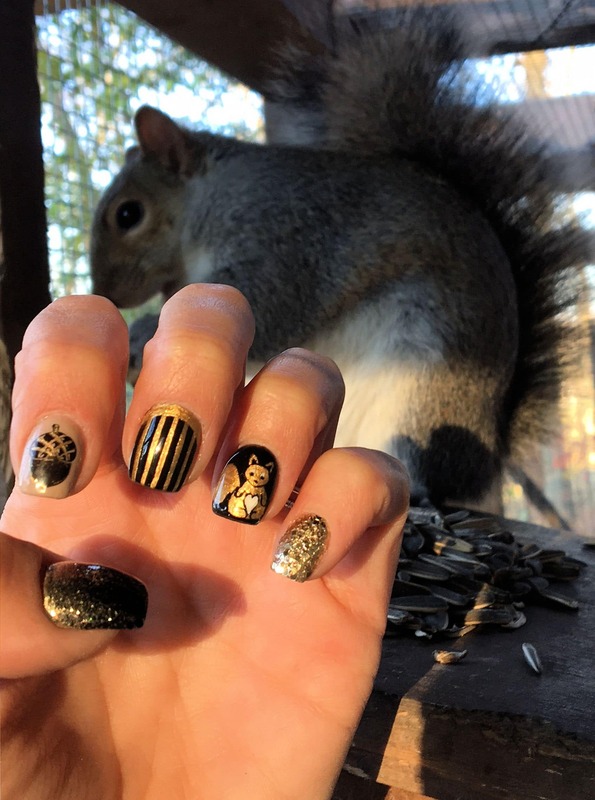 You can choose abstract or an actual detailed picture, such as my nails here, with the squirrels. I took my inspiration from my personal pictures, as well as watercolor paintings online. Squirrels may seem crazy (they are) but they are one of the sweetest animals I’ve ever had the pleasure of raising. I hope you enjoy my little woodland squirrels, with their acorn treats! 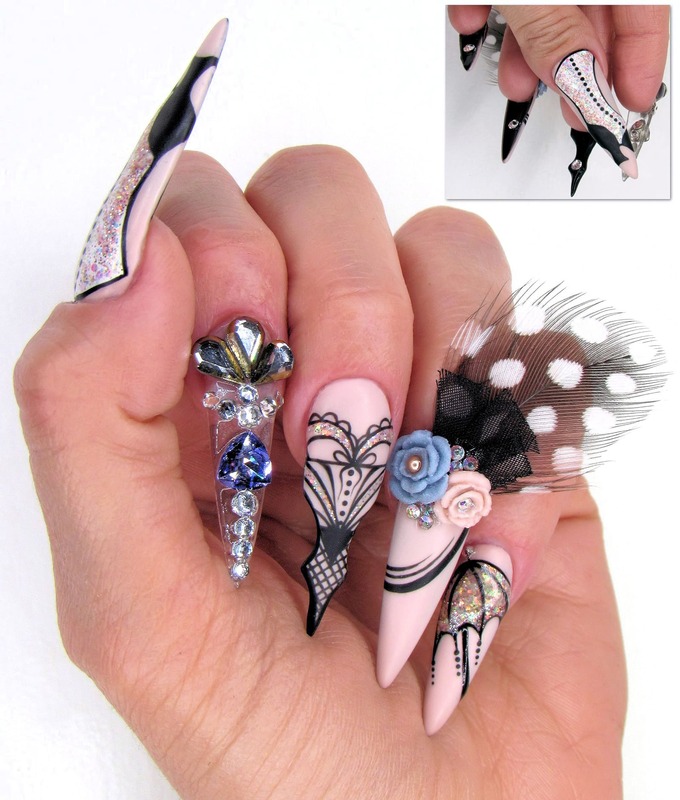 To challenge myself, I first created a set of stiletto nails on myself with Trinity Pro-Performance Gel. I chose to create my design based on the Edwardian period, an era that I have been enamored with for years and years. My grandfather was a jeweler, and I have inherited pieces of jewelry from family that fit into this time period. I have a huge love for the jewelry of this time, being as it was made of large colorful precious stones, surrounded by clusters of diamonds, and hugged by the most ornate filigree gold. Just as the jewelry was fancy, so was the clothing. Tight corsets cinched the waists of ladies who were dressing for daily life in the most beautiful dresses with so much detail and sophistication. This carries over to their choice of hats. These amazing hats were made with delicately placed flowers, fabric, bows, and feathers and worn at a slight angle. Lastly are the shoes, most of which were leather boots lined with buttons as a closure. So simple, yet so beautiful. Next was to choose a beautiful, handmade parasol and head out to the park to socialize. The effort put into one’s appearance in the Edwardian period is astounding. A quality of life is what they had, and they looked gorgeous living it. The CND/Libertine friendship has been something I have followed for several years. 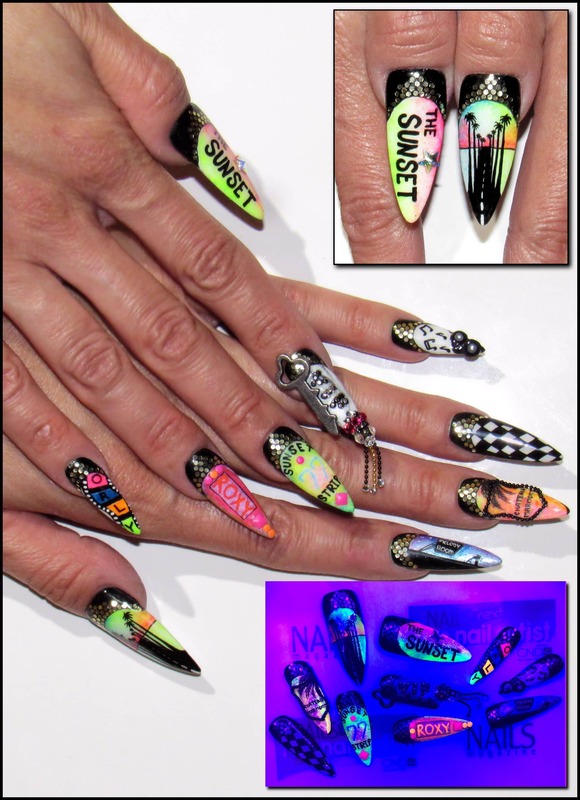 There is nothing better than watching Jan and the CND team create amazing nail art for such an artistically bold designer. They are two peas in a pod! I was immediately drawn to Tracey Lee’s nail from NYFW because of the black and white stripes and colorful flowers, as well as that amazing crystal cluster. I spent some time looking at the nail to determine my design. I chose to create an intersecting stripe design, leaving a blank space for roses to be painted. The way of painting my roses was influenced by the art seen on the runway. The circular pattern and the bold colors fit right in. At the very end of my design video, you’ll notice I also added a color to the middle white stripe, to give it more of a mismatched look. When it came time to accent my fingers with a complementary design, I immediately thought of the crystal cluster and gold accents on Tracey’s nail. 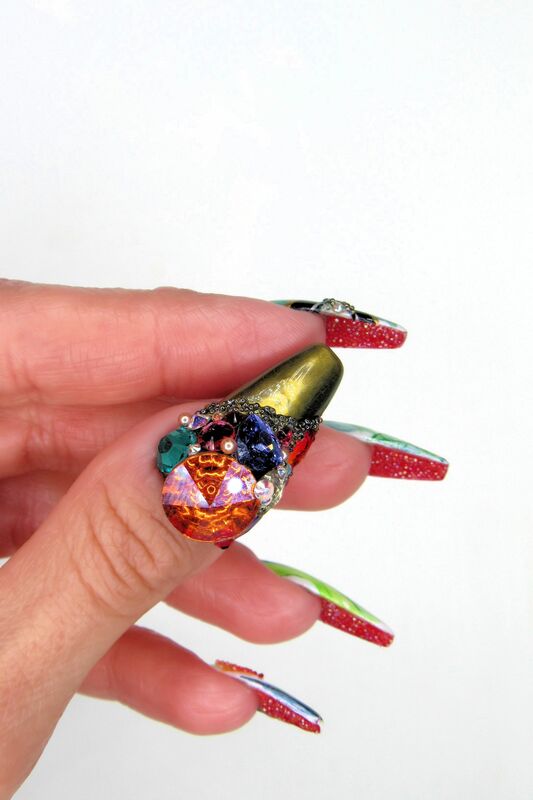 Using gold foil and crystals, I created a one-of-a-kind design element to go along with my set of nails. Click here to see a video diary of Dana’s nails.